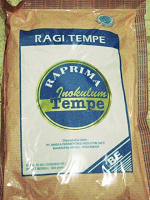 Tempeh Starter ( Contains Rhizopus Oligosporus/Rhyzopus Oryzae and Organic rice powder ) 50 Gr. Take advantage, order the 75 grams package and shipping prices will be the same as 50 grams package! 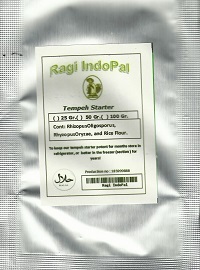 Our Tempeh Starter Kit can produce more then 78 Lbs Tempeh!, and contains enough starter for 20 batches. 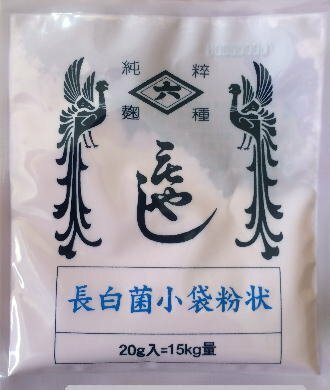 The Tempeh culture contains spores of Rhizopus Oligosporus, Rhyzopus Oryzae, and rice powder, needed as a mixture medium, which makes a beautifull white tempeh, and keeps the traditional taste! Our prices and shipping are the best, and produces 78 lbs Tempeh. It's easy to make tempeh at home at a very low cost. Soybeans are soaked overnight, cooked for about 30 min and mixed with tempeh starter. After 28 to 32 hours incubation you have delicious fresh tempeh. Starter kit can produce more then 78 lbs tempeh.